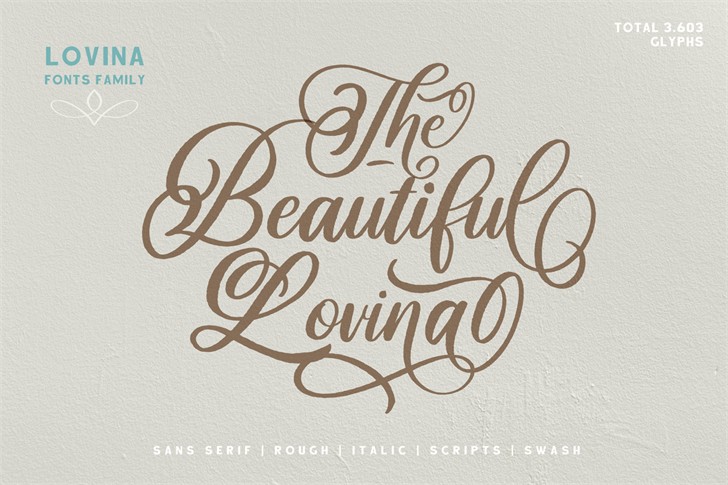 Beautiful Lovina Fonts is just for personal use. Introducing Lovina Font Family is our first Font in 2019, has a handwritten script style with a touch of natural rough from the shape of the brush. For Scripts, Lovina fonts have 2 choices namely "Lovina Regular" and "Lovina 2 Regular" in this font script there are many alternative choices of characters from Swash Lowercase, SS01 to SS06. Lovina Fonts Family is very worthy of being the newest collection in 2019 as a project design creation, social media quote, badges, logotype, fashion design etc.